Why was this audit so important? 2012 was a tipping point, and 2013 is the year of consolidation for the luxury market in China, the old rules have changed, and new ones now apply. Service in China’s luxury stores has typically been lower than many other places in the world for many reasons, but it could easily be improved and used as a differentiator in a more difficult market. In this report we set out to determine the current level of luxury service in Shanghai, the city we would expect to have the most demanding customers, and some of the best stores in the country. 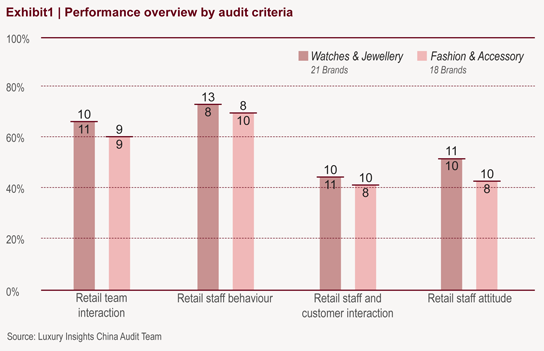 This report summarises the findings of the first ever, independent multi-brand luxury store audit carried out in Shanghai across the Watches & Jewellery, and Fashion and Accessory sectors. 39 stores belonging to 39 individual brands were audited over a two-week period by the same audit team, using consistent audit criteria to ensure repeatability of the data gathered. What did Chinese consumers actually say to us about their luxury service experiences? Note: The actual performance results of the stores audited for this report remain anonymous within it, and performance data shown graphically is for comparative purposes only. Exhibit 1 below shows the average score for each of the four audit criteria categories and both luxury sectors. The figures at the top of each column indicate those above and below average in each case. Exhibit 2 and 3 below demonstrate how individual stores in both luxury sectors performed across all the audit criteria. The 0% line is the transition line between basic retail service, and ‘standard’ luxury service, the expectation is that every store should attain a full score on the lower part of the graph as the criteria that were used are those we would expect to find in more common and less expensive retail environments. Above the transition line, the audit assessed performance against criteria to be delivered in all luxury stores that was not necessarily likely to be found in non-luxury stores. Accepting that staff are human and perfection is not always possible, stores that were performing acceptably should attain an overall score of 90% to 100%. Chinese luxury consumers have become savvier in the past year in many ways, one being their understanding and expectation of luxury service standards. Many have travelled internationally and experienced luxury retail service that has established a benchmark in their minds, and a feeling that they are paying more and getting less overall from luxury brands in China. In this report find out exactly where luxury service is failing customer expectations, and where it can be improved and used as a differentiator in todays more competitive market. The report identifies the areas of weakness of the stores audited and provides additional observation and commentary to the quantitative measurement results.